My dear friend John Wilson, editor of Books & Culture — which you should be subscribing to, by the way — called yesterday evening and asked if he could drop off something at my house. 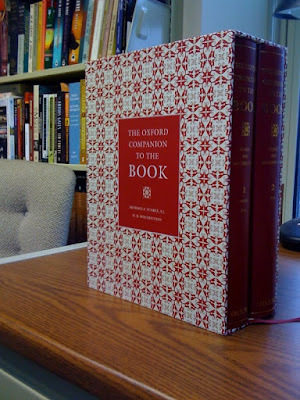 It turned out to be a copy of the brand new Oxford Companion to the Book, which I will be reviewing for B&C. Oh my goodness. I have so much else to do, but . . . this is really, really beautiful. Ooooo luvly! I have a serious case of book envy. btw, I've just taken possesion of another fabulous Oxford release I bet you'd love -- the Historical Thesaurus of the Oxford English Dictionary, a 2-volume mamouth that has a fascinating dual classification system. The entries are organized by concept, with the second volume alphabetical, cross-referencing to the concept entries in volume 1. So you can search by word or browse a section of related entries. And its got all the OED history, etymology, etc. so it's like having the best parts of the OED. Easy to lose oneself for hours! Found it new on Amazon's used for half what the Amazon regular price is. Sweet! But free review copy is even better.